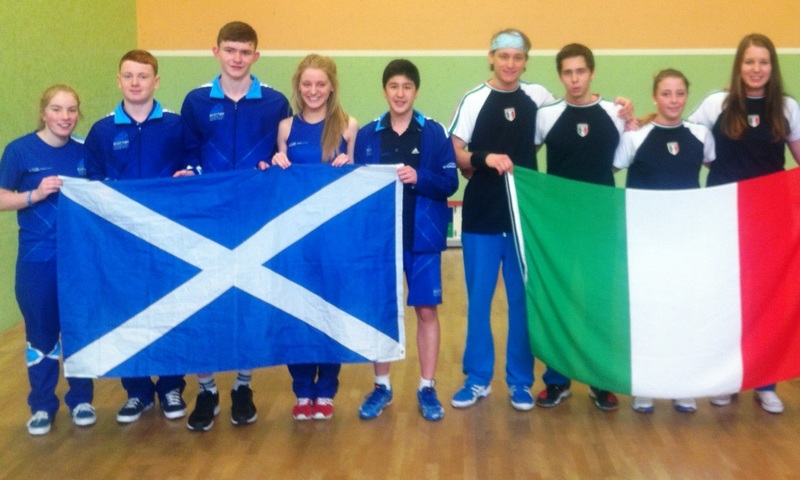 The U15/17 European Team Championships were held in Prague last week (8-11 May), with Scotland represented in the U17 event by Richard Hollins, Patrick O’Sullivan, Mark Coyle, Carrie Hallam and Katriona Allen, and by Alasdair Prott, Chris Murphy, Jack Orr, Emma Fitzsimmons and Georgia Adderley in the U15 event. Both teams were accompanied by Assistant National Coach, Stuart Crawford, Highlands RPN Head Coach, Robin Hamill, and Susan Fitzsimmons as chaperone. The U17’s started their campaign with a relatively straight-forward tie against Norway. Mark Coyle, representing Scotland for the first time, got off to a shaky start losing the first game 12/10 before his nerves finally settled for a 3-1 win. Richard and Carrie both won 3-0 to get the team off to a winning start. The second match of the day for the U17’s was against No.1 seeds England – always a tough ask at any age-group – and so it proved as they lost 3-0, although Richard put in a more than respectable performance against the current British U17 Champion, Patrick Rooney. The U15’s finished off a long day by losing 3-0 to a strong German side who appeared to have been seriously under-estimated by the seeding panel. 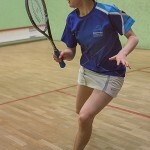 Emma continued her earlier form and was the only player to win a game. With the U15’s now unable to reach the quarter-finals, their final Pool match against Switzerland gave Jack and Georgia a chance to play their first matches in the event. Switzerland had already defeated Ireland and Germany on Day 1 and were guaranteed to top the group. Al and Jack both lost 3-0 before Georgia once again demonstrated her rapid improvement of late with a superb 3-2 win against the Swiss girl. The big match for the U17’s was against Spain, with the winners likely to secure a place in the quarter finals. 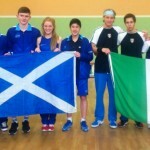 Scotland were hoping for a repeat of the recent meeting between the two teams at the Senior ETC, where Scotland narrowly won 3-1 thanks to Alan Clyne beating World No.5, Borja Golan. With the Spanish girl already No.2 in their Senior Women’s team it was likely that Richard and Patrick would need to win against the Spanish boys. Carrie lost 3-0 as expected before Richard recovered the tie with a 3-0 win of his own, leaving Patrick to play the decider against an opponent who looked to be significantly stronger than their supposed No.1. Patrick found himself 2-0 down after a slow start but was certainly not out of the match given the number of chances he had created in the first two games. 13961081238 f975ff521f_zDespite having game-ball in the second he regained his composure and saved matchball in the third to pull a game back before levelling at 2-2 by sticking to the simple plan of frustrating his erratic opponent into errors. However, the Spanish boy upped his level in the 5th and cut out the errors to claim a 2-1 win for Spain. The team were now devastated at having been so close but had to pick themselves up to face Sweden in their final Pool match later that day. 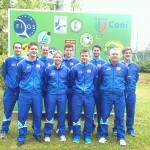 Despite some understandably tired performances, they were able to win 3-0 with wins from Carrie, Richard and Patrick. An unexpected start to Saturday morning saw half the players wake up with sickness, diarrhoea, or in some cases both. It later turned out that we were not the only country affected by this and a suspected batch of the tournament food from the previous day appeared to have caused problems for several teams. Despite this misfortune, the players responded well with the U15’s easily beating the Netherlands 3-0 without conceding a game and the U17’s going 2-0 up on Italy with 3-0 wins from Richard and Carrie before Mark Coyle replaced Patrick in the dead-rubber and lost 2-1. 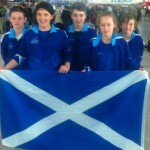 This put both teams into the 9-12 play-offs with the U15’s up against Wales and the U17’s against Israel. Wales proved too strong for the U15’s with Al Prott losing 3-1. 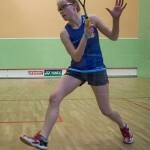 Emma -_illEmma found herself 2-0 down but recovered to 2-2 and held matchball at 10/9 in the fifth before losing 12/10 – but another indication of her rapid improvement since the Five Nations where she lost 3-0 to the same opponent. Jack replaced Chris in the dead-rubber and played a very good match but lost 3-1. The final tie of another long day started with an excellent match between Richard and Israeli No.1 Nadav Raziel, which the Israeli won 3-2. Carrie set up Patrick for another decider with a comfortable 3-0 win before a scrappy match went Israel’s way in a very physical encounter. The final matches of the weekend saw both teams playing for 11/12th position. The U15’s won their match with Sweden 3-0 thanks to a solid performance from Al (3-0), excellent comeback from Chris (down 2-0, won 3-2) and another faultless performance from Georgia (won 3-0). This gave them 11th place, which was a slight improvement on their initial seeding of 12th. With 3 of the 5 players still eligible for the event next year, they’ll be hoping to build on this result with another year of training and physical development. The U17’s played Denmark and went behind after Richard was unable to match his form earlier in the week as he lost a close match 9/11 11/13 10/12 against long-time rival Magnus Larsen, who he’s had several battles with over the years. 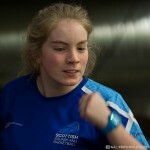 Patrick was able to hold his nerve at the crucial stages to set up Carrie for the decider with a 3-1 win but she was unable to produce her best squash when she needed it the most as she lost 3-0 to leave the team to reflect on what might have been if they’d just beaten Spain. 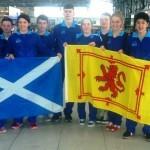 Overall the event was another success for Scottish Squash. Despite some disappointing results individually, all the players represented their country with pride and 100-percent effort at all time. History tells us that the best predictor of long term success for players at this age is not necessarily results but other qualities such as attitude and commitment – something which is certainly not lacking amongst any of the players involved.